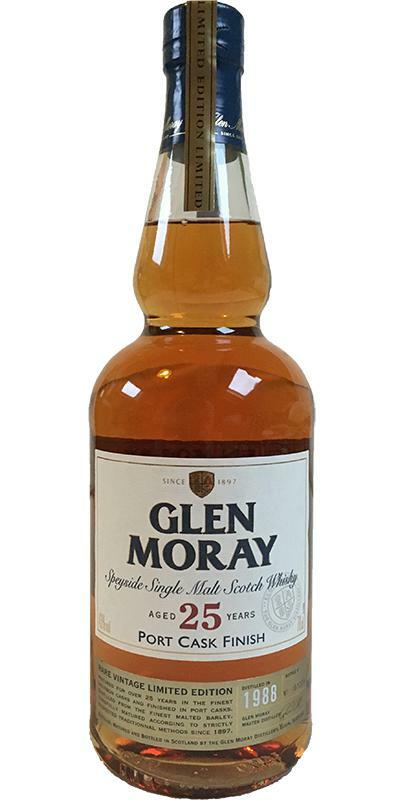 a glen moray a little old to change basic finishes? macerated fruit (grape and orange-tangerine), dust, nuts, spices, and well-sodden wood, it goes well! it's spicy !! the scents lose a little of what one could expect on the nose, as if there was an impromptu addition of water! we are on a sweet sherry, watery, peppery, the fruits are less present, the wood a little more! mold, nuts, raisins and dirty grasses! long enough, less pronounced than the nose, but this scent "young sherry" I like! For me, the first impression left something to be desired. Taste being a bit better, but the finish already was very good. Fortunately time did the trick and made a lot of difference to nose and taste. I think a bit higher abv would help this one. At first there is very little going on ... Something underground and loamy works its way up after a while and tickles my nose. But, now, yes, there comes something. Fermented fruits, still the damp clay soil, cellar smell, leather, malt. Very spicy with pepper, nutmeg, tarragon and savory. Oh very nice. So behaving in the beginning was so full of flavors, he shows himself now. And I let it breathe in the glass 15 minutes before the first nose. A little panned, the spices are again promoted reinforced in the nose. The spice are now leading the aromas, in the background swing the fermented fruits and leather. Crispy and oily on the cake, with lumpy orange marmalade, honey and freshly split wood. Grapes lend sweetness, but at the same time there is something herbaceous, spicy, which in turn reduces the sweetness of the fruit. The spices from the nose, but not so intense. Almond flavor and milk chocolate, hot steaming cocoa. Cooling menthol comes after a while. Medium to short, slightly dry and slightly spicy. Menthol cools, and in the distance the taste of a raspberry sweed-away. Will be a little thin behind. Nose: beautiful lush corn sweetener (reminiscent of Irish whisky), honey, orange peel, dry wood, sawdust, old wet leather flaps, vanilla, white pepper Quite own and exotic - makes you hungry for the first sip! Taste: soft and supple, spicy honey, orange zest, then full cannon oak, old wood, leather, bitterness, medium-long finish with charred oak, spice cake, coffee and yet a bit of fruity sweetness to the rear. The sweetness is becoming more and more dominant. Damn it's easy. The alcohol is very well integrated. He looks a little too thin on the tongue, despite full flavors. Great whisky but the certain something is missing to completely convince. You can hardly feel the age. But he will certainly be remembered for a longer time due to his peculiarity. would have never blindly typed on a port barrel, quite atypical, but not necessarily bad. Funny thing that I could not really put my finger on the Port influence - wood, yes, but the port is not present (maybe for the better). The whisky is not impressive and I'd rather stick to the younger siblings at astonishing prices. First impression is of a very refined nose. I tasted this after a 14yo Old Particular bottling and this seemed like a tamed and mellowed version (ok, matured). Gentle sweetness, perfume, malt. Water (just a few drops) - triggers some grassy notes, which i like. in 15 min gets more into the fruity and perfumy profile and some nuts get through. In another 30min it really is all about walnuts. Reminds me of a good oloroso cask. Too spicy for my liking. I guess the wood has been too influential here. Water - improves dramtically; the spiciness is in check; lots of oranges - all kinds. Long, spices, then some sweetness and scented wood. Fruit, citric acid, dates, polish, spice mix, wet sawdust, cinnamon, malt. Raisins, dried apricot, dark chocolate, mint, honey, BeBe biscuits. Grapefruit peel, tannins, sap, lemon balm (tea). 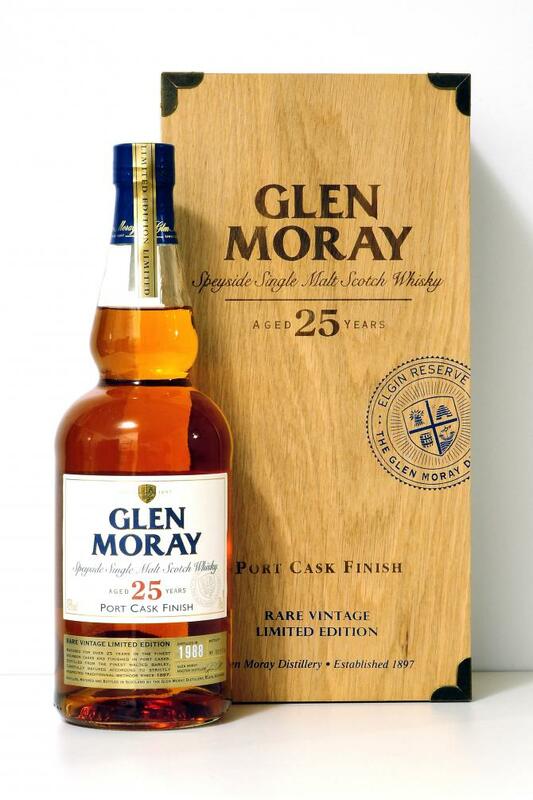 An old, mature, very good Moray! Pleasant elegant whisky. However, it is necessary to take a bit of it. Very light and elegant fragrance. Fruit compote, light tones of light spice wood, honey, cane sugar, sweet white wine, corn and spekulatius biscuits. Sweet, lighter and more complex, with a delicate bitterness. Oily with fruit, cinnamon and honey.